Four years ago I wrote about a giant gorilla that had appeared on a wall opposite my kitchen window. It stayed there for at least a year before slowly disappearing behind the rising walls of a new construction. It’s still there now, perhaps one day to be uncovered by future urban archeologists. I grew quite attached to that gorilla. But then it wasn’t just any gorilla, it was a Zoo Project creation. A little earlier on the blog I’d wondered who was behind the Zoo Project label. Could just one single prolific creator be behind these monumental pièces - the giant half-human, half-animal beasts, the absurd chains of masks, the robot office workers, the packs of sheep people - that were appearing on walls across the north and east of Paris? Zoo Project was indeed just one person, and someone we have recently learned a lot more about - but in the saddest possible of circumstances. Bilal Berreni, the young man behind the tag, was recently reported dead in Detroit. Even more tragically, his death dates back to last July. It has taken the local authorities this long to connect his name to a body that had been found on wasteground in the city last summer. Bilal was only 23 when he died. 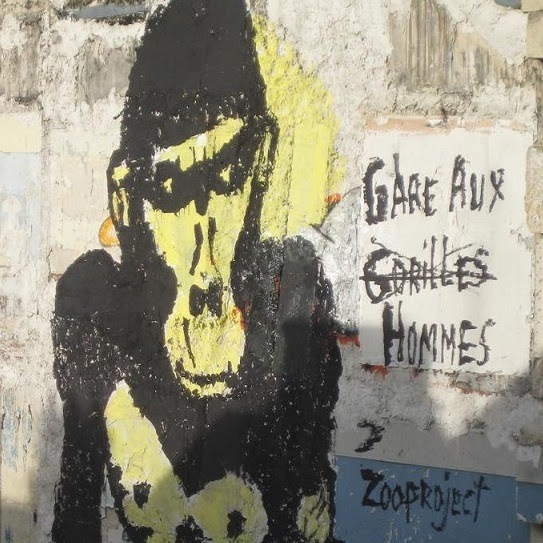 He'd have been 19 when he painted the gorilla in my street, as well as most of his other creations in Paris. Although I wasn't carefully following his activities, I did notice that the paintings had stopped appearing on the city's walls. Later I read that he'd gone to 'see a revolution' in Tunisia. 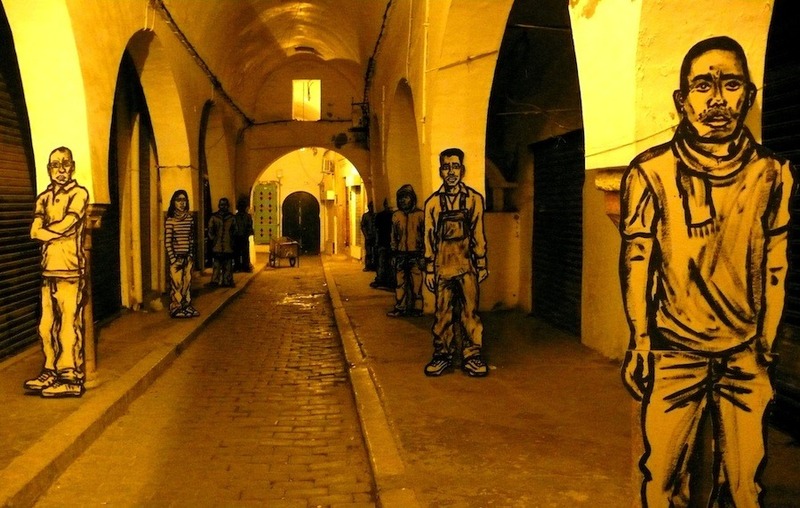 There he found a new mission, painting portraits of protesters who'd been killed and displaying these life-sized models in prominent places around Tunis. He then spent a month living in a refugee camp near the border with Libya, simply drawing portraits of the refugees in order to 'bring back their dignity'. This was the first time he'd communicated too, via his website (although more to bring attention to the Tunisian people than his own work). 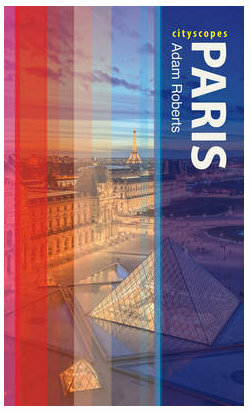 The Paris creations - it's now clear - were throwaway sketches, the playful mischief-making of an alienated young man. The real messages, the real power of the street, could not be found in Paris. So he left for good. His friends and family didn't always know where or why. The only record of this journey is a documentary film, 'C’est assez bien d’être fou', chronicalling a road trip across the ex-Soviet Union. At some point came the pull of the American magnet. It's not clear what he was doing there - there are reports of sleeping rough, in squats, jumping freight trains - even a stretch in prison - but little in the way of artistic creation. Detroit seems a logical destination, the archetypal dystopian city, the first major ruins of 20th century capitalism. It is also one of America's most dangerous cities. Bilal, we have now learned, was shot, perhaps having crossed the wrong people on one of the city's urban wastelands. When artists die their creations live on, but Zoo Project's works were designed to be ephemeral. 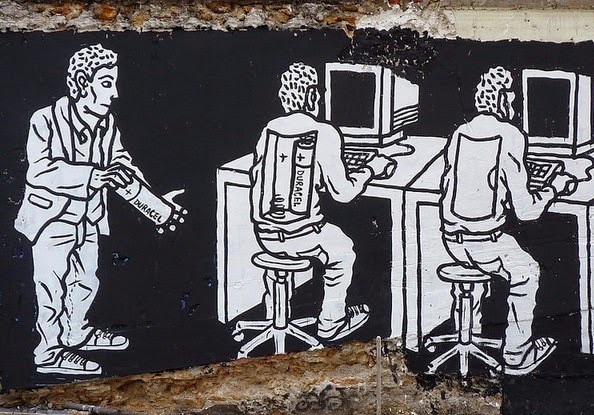 Street art is about having something to say and the courage to say it, but also the acceptance that it will not last. The creations are just transient marks on in-between landscapes. The gorilla wasn't removed. I saw it being carefully hidden away behind bricks and concrete. Is this also true of Bilal's other creations around Paris? When the modern city collapses, when it comes to be replaced by something else, will future developers uncover an army of creatures from Bilal's strange zoo and study exactly what they reveal about 21st century Paris? In an interview with the Detroit Free Press, Bilal's father sums up best his son's struggles. “He might not have been born at the right time” he concludes. Being brought up in streets that had once been at the centre of revolutionary Paris, the vacuity of modern society was an anathema. 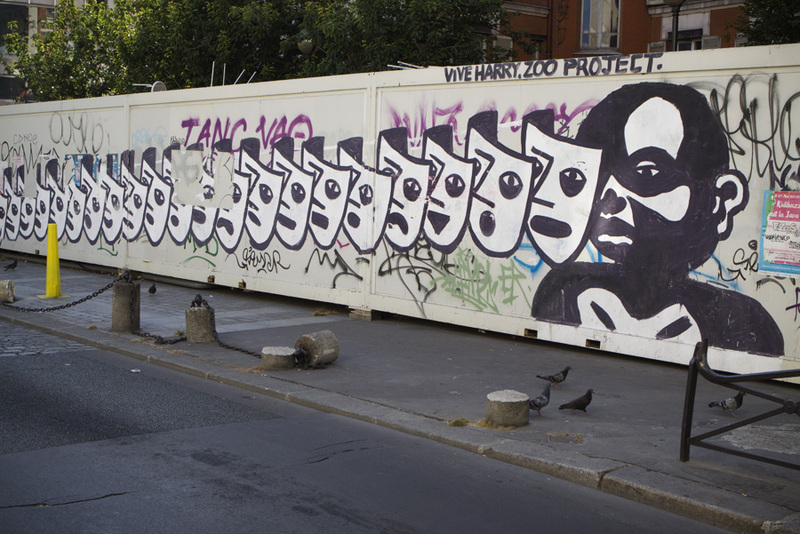 Paris - the world - has lost one of its true street artists, someone who thought not of his image, his brand, his career, but simply of drawing his convictions in black and white. As he once wrote, 'si le silence est d'or, le bruit est de beton'. Thanks for a moving story, and for having recorded his work. Seems like a very creative guy, lost way too soon. No telling what he would have gone on to do in life but I bet it would have been special. Amazing, moving, thank you. My thoughts with his father also. Tristesse a la lecture de ce billet mais il a permis a Bilal Berreni de percer un peu plus en apparaissant ici. D'ou l'importance de toute communication en direct. What a fascinating, sad story of one of Paris’ youthful artists who “might not have been born at the right time.” Let me mention his name…Bilal Berreni. "4 face court hearings in death of French street artist in Detroit"